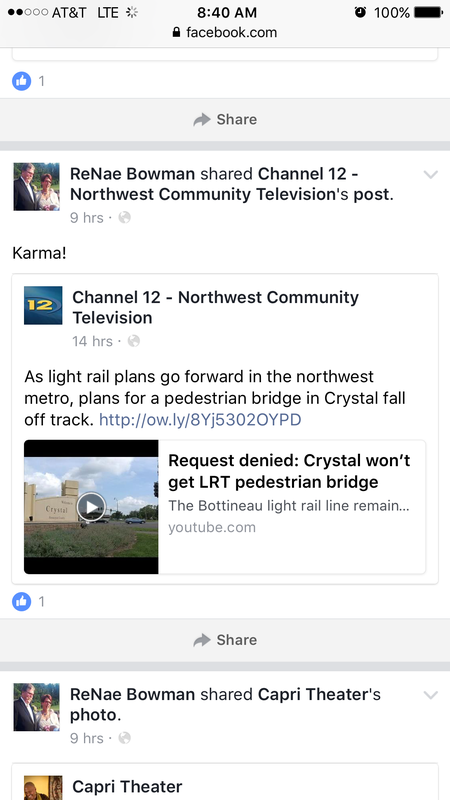 Well, Mr. Legacy Builder himself just torpedoed the city of Crystal on the construction of a pedestrian bridge over county road 81 when the stupid light rail comes through. Crystal asked for one thing on this project: a pedestrian crossing. This request came largely from the community, not the council. They were given “assurances” that the bridge would be included in the project and they recently reached a deal with the Met Council as to the cost. I don’t know any other way to put it- we were played. And we were played by people who are better at this game than we are. So we lost. The Crystal City Council, and the Crystal City Staff did, in my opinion, everything we could possibly do to fight to represent our residents, but at the end of the day someone else decided we didn’t need a bridge so now we don’t get one. Really interesting that the guy who supports a Twins stadium, a soccer stadium, and a $1.5 light rail project thinks a pedestrian bridge is too expensive! To me the truth is that I think the Met Council and Mike Opat lied all along to Crystal. They knew this council was hostile to this project and the city council tried hard to work in good faith for what citizens asked for. Then they were stabbed in the back. Karma? Why are you happy Ms. Bowman? Why are you regarding bad news for the city as good news? We all know why: you are hateful person who hates the current council so much for not being a lap dog for Hennepin County and the Met Council like you are. John John Budziszewski is running his mouth on twitter claiming the mayor and council showed a lack of leadership. huh? How do you figure that? The council listened to what citizens wanted, took those concerns to the management committee, and fought for them to be included in the project. Why aren’t you mad at Mr. Opat and the committee for not keeping their word. I’ll tell you why: because you are so blinded by hate (hatred towards the people who beat him in an election) that you don’t care what Crystal citizens want. My advice to the city council; keep doing what you are doing. You took an oath to Crystal, not Hennepin County or the Met Council. Let the angry birds squawk. They have nothing else to say. Entry filed under: Brooklyn Center, Brooklyn Park, City Government, County, Crystal, Golden Valley, Mayor, Met Council, Taxation, Transportation. Tags: Crystal City Council, Jim Adams, John Budziszewski, Mike Opat, ReNae Bowman. Bad News for the Angry Birds and Sour Grapes	Is Brooklyn Park Doomed?